/ Modified jan 4, 2019 2:45 p.m.
Pedestrians at the midway point on their way up Tumamoc Hill. 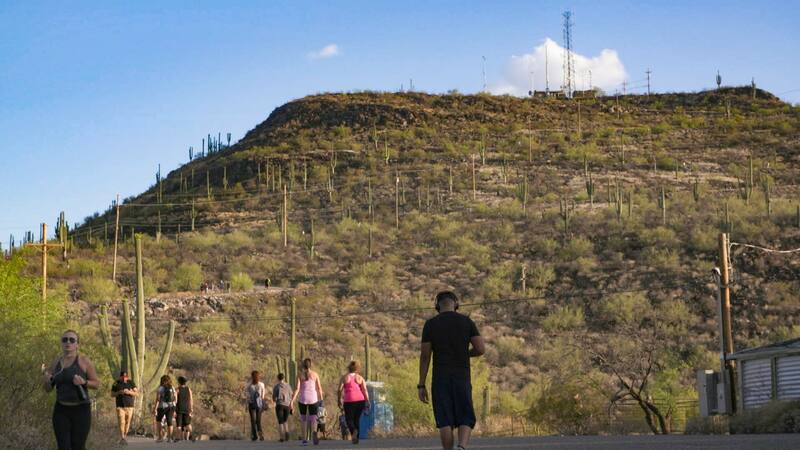 Tucson's Tumamoc Hill is undergoing a transformation this year. The University of Arizona plans to repave the 1.5-mile road up the hill later in January month. The change will make the path easier for walkers and researchers. The UA says it will also preserve the ecological and historical elements of the property. The repaving is set to start Jan. 22. The Hill will be closed to walkers for two weeks. Tumamoc is an 860-acre ecological reserve and U.S. National Historic Landmark owned and operated by the UA in partnership with Pima County. The Desert Laboratory at Tumamoc was created in 1902 by Andrew Carnegie, beginning more than 100 years of ecological research on the hill. Scientists and other researchers work on the hill to study its plants, animals and other features.